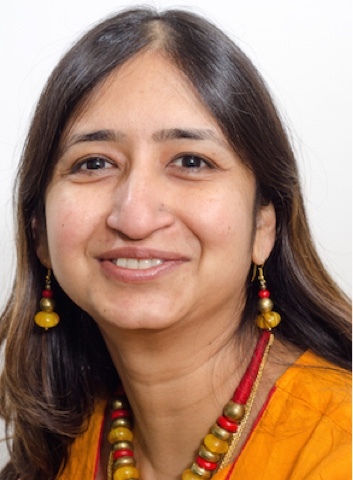 Today we have a guest post from author Chitra Soundar, author of a gorgeous new picture book re-telling a traditional Indian flood myth. 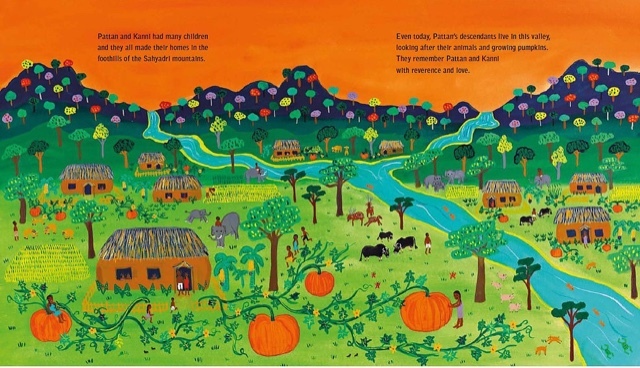 It’s great to stop by at CultureBaby to tell you about my new picture book Pattan’s Pumpkin. Here we come rolling down the mountain to talk about a story so ancient that it has only been passed down orally through many generations. Ancient legends, folktales and even ghost stories that came to us from our ancestors give us the foundation to build our imaginations. While some stories manage to get written down, many are still hidden in the wisdom of our elders. Pattan's Pumpkin is one such story that has never been written down until now. It is not just a story of ingenuity and adventure, but also of Pattan’s love for his valley, animals and birds that live there. When I discovered the skeleton of this story, it fascinated me because it was set in the UNESCO heritage site of the Western Ghats. These mountain ranges are older than the Himalayas. They feature in Indian epics not just as part of our physical landscape but also add to our cultural heritage. In this valley for thousands of years, tribes have lived in harmony with nature. But in the recent past, the land grab of modern society has deprived many communities of their habitat and their heritage. This story that I had found in the crevices of research notes came from one of the Irular tribe. The story Pattan’s Pumpkin predates this tribe’s reputation as hunter-gatherers, when they were guardians of the land in the valleys of these mountains. In recent times, this tribe’s reputation as snake-catchers fascinates the urban dweller. But it also denies the tribe a dignified place in the society. While every religion told its flood tales, this one was unique. This wasn’t about the religion, but about the determination of one man and his love for his valley. In contrast, the story of Manu and the Fish is a Hindu flood tale that involves a boat just like the Christian story of Noah. But Pattan isn’t a boat-builder. He is not getting help from Vishnu, in the form of fish. Pattan has to use his own ingenuity and his enormous pumpkin. This resonates with history when people of both Asia and Africa hollowed out gourds like the bottle gourd and pumpkins to create drinking jugs and calabash. But how do you explain the enormous pumpkin without imagining a miracle? Super-sized pumpkins are neither miracles nor a freak of nature. The world’s largest pumpkin in modern history weighed 2323.7 pounds in weight in 2014. If a modern-day farmer from an industrialised nation can produce a massive pumpkin with good seeds, organic fertilisers and tremendous care, then I’m quite inclined to believe that the enormous pumpkin that Pattan grew wasn’t a miracle at all – but the habit of nature when she’s undisturbed and protected from human greed especially in one of the most bio-diverse valleys in the world. For me this story is not just a rollicking Indian tale about a bumpity-bump ride inside a pumpkin. It is that. But it is also about living in harmony with nature. It is for every child who deserves a greener tomorrow. I really hope children enjoy reading this story with their parents and grandparents. I hope they enjoy the words and the fabulous pictures by Frané Lessac, and also take in Pattan’s message – cherish the nature around you, nurture it and pass it on to your descendants. 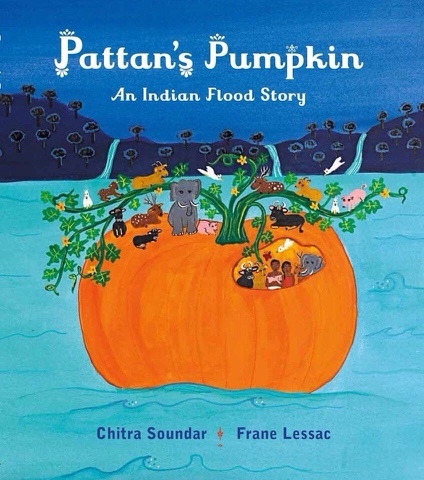 Pattan’s Pumpkin by Chitra Soundar is available now here. Chuyên nhận lắp đặt cửa kính tự động tphcm với cước phí thấp và chất lượng cao nhất. Thuận Phát chính là nhà cung cấp cửa kính tự động hàng đầu tại Việt Nam. Ngoài các mặt hàng cửa kính tự động, TP cỏn chuyên nhận thi công, thiết kế các loại cửa trượt tự động nhật bản với chất lượng tốt nhất. Có thể bạn đang quan tâm rằng dùng thuốc nhuộm tóc nào tốt để chăm sóc tóc của mình được tốt nhất. We are really grateful for your blog post. You will find a lot of approaches after visiting your post. I was exactly searching for. Thanks for such post and please keep it up. Great work. Releases New Children's Book.